Every person, every business has a story. StoryScreen, LLC was created to bring these stories to life through the production of compelling documentary films that can be easily shared with as few as a dozen friends and family members to millions of potential investors and future customers. Small businesses and individuals can now enjoy professional documentary film services that match the production values of broadcast TV and film. At StoryScreen, we develop and produce captivating short and feature length documentaries through careful story development and writing, beautiful, rich cinematography and dynamic editing, resulting in broad, accessible digital web distribution. StoryScreen, LLC embraces the beauty and depth of documentary filmmaking from extensive research of the subject as part of pre-production through careful calibration of style for every unique story. Powerful documentaries are no longer the exclusive realm of presidents and rock stars – StoryScreen puts your story on a screen. Brett A. Schwartz is an Emmy®-nominated documentary film director/producer based in Chicago. Schwartz’s latest feature documentary, INSATIABLE: THE HOMARO CANTU STORY (2017) premiered at SXSW, screened at numerous film festivals around the world, and has streamed on Hulu, Amazon, iTunes, and other platforms. . Schwartz’s previous feature-length documentary, MASHED MEDIA (2010) aired on PBS and is distributed by Films for the Humanities & Sciences. Schwartz’s films have screened at numerous film festivals including SXSW, Slamdance, The Seattle Int’l Film Festival, The Napa Valley Film Festival, Cinequest, The Chicago Intl Film Festival, Palm Springs Int’l Film Festival, and many others. His work has aired on several networks, including Bravo, MSNBC, HGTV, Court TV, CBS, PBS. His short film SHIFTING TRADITIONS aired on PBS and was distributed by The University of California Center for Media and Independent Learning. 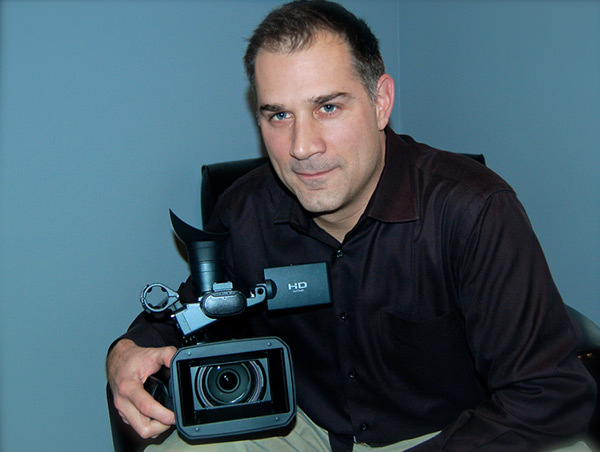 In addition to producing films and videos, Schwartz has been teaching for over sixteen years. He currently teaches film and TV production, Journalism, and History at Deerfield High School in Deerfield, Illinois. Schwartz received a Master’s in Documentary Film and Video Production from Stanford University, an MA in Social Studies Education from NYU, and both a BA in History and a BFA in Photography from Cornell University. Brett Schwartz’s passions, talent, intelligence, and education come together as tightly knit tapestries in the documentary films he produces… His sensitivity and thoughtfulness toward his subjects results in interesting perceptions and creates a new way for the viewer to look at what he presents… His most important skill is his uncanny ability to draw the best from the person he is interviewing… He makes people forget the camera so they are able to speak naturally and honestly as if they were simply having a conversation with a friend. Brett Schwartz is truly an artist with the camera.